Nestled amongst gorgeous Douglas fir trees perched on a bright SW facing corner lot just a blk off Bigelow is this colonial home w/ 4 coveted bdrms all upstairs, incl a mstr suite. Stunning liv rm bay window embraces lake, city and mtn views. 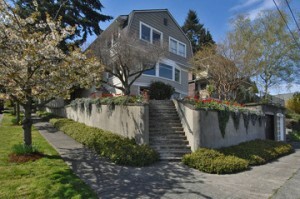 Fml d/r, fab kitch area and great room spills out to level Western facing backyd. Add new systems, roof, paint, landscaping, powder rm, fin lwr lvl w/poss MIL w/kitch or just fun media/rec rm. Garages off Newton and on 5th N. Won’t last w/4 bdrms up!